I keep reading about people who have finished their school year and am so jealous. We just aren't there yet, but then we never planned to be until the end of May. When compared the local school districts who had so many snow days that it seems they will now spend most of their summer in school, we are doing great. Amber survived the extra, super duper long Hobbit rehearsal Saturday evening. Fred took her to the practice, and even though I feel bad that he had to sit through an unexpectedly long rehearsal, it gave me time to finish projects at home and deal with dinner issues. The two of them arrived home at 10:30 pm, without having had a proper dinner. At least I had something waiting when they walked in the door. Amber did wonderful in her couple of scenes during the Hobbit. She not only loved the class all semester but enjoyed the performance too. 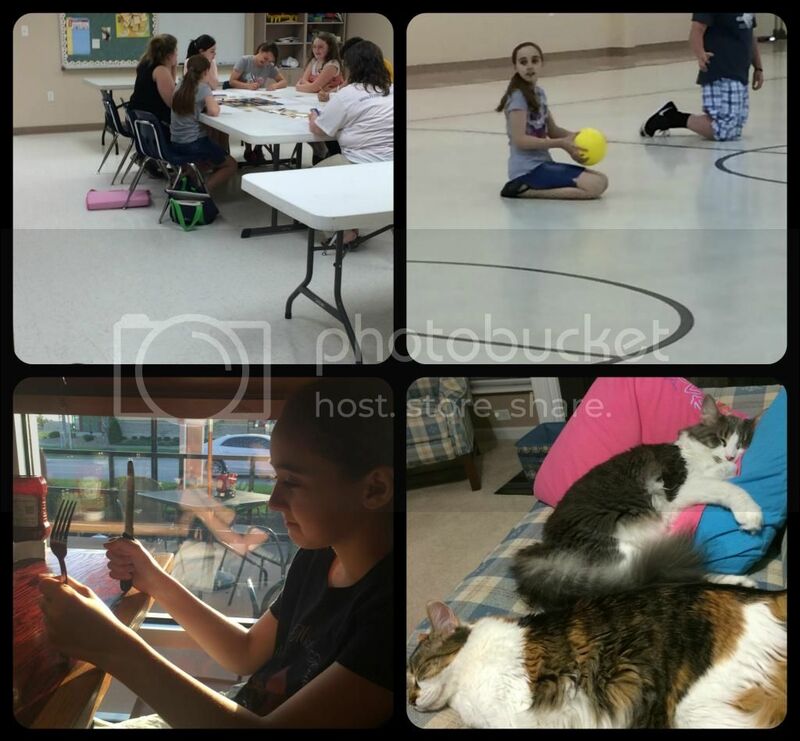 We have been so pleased with this homeschool group and can't wait for classes to start up again next year. Amber and my mom after the performance. Amber dressed as a goblin and Amber at home, before the performance... that is her "no more pictures, I mean it" look. 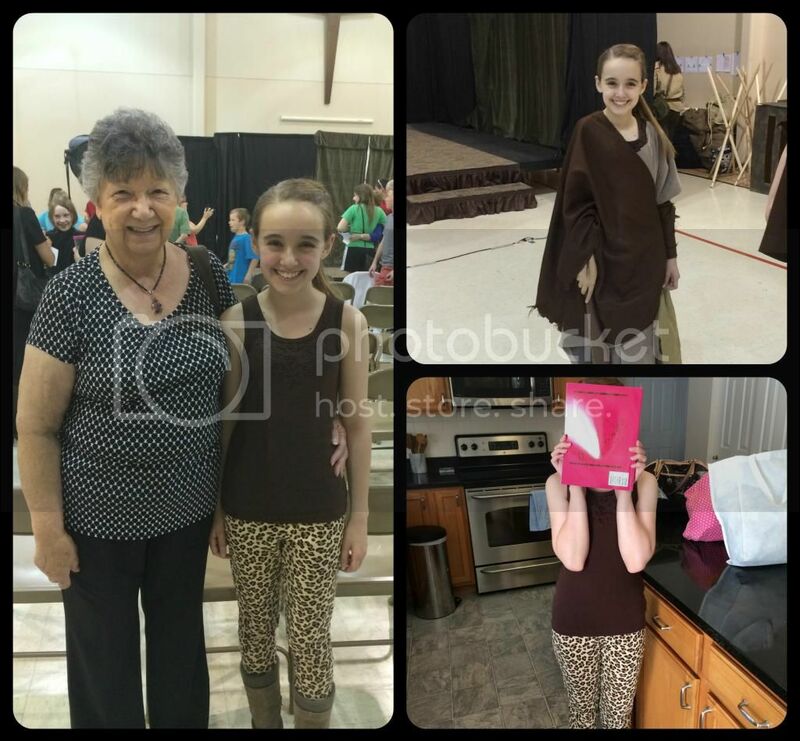 There was one more day of homeschool classes after the performance evening, but it was all fun and games. Amber had a blast that day and left telling me that "she was so happy, I don't care what is for dinner." This is extreme happiness, because usually she is quite temperamental over dinner choices. 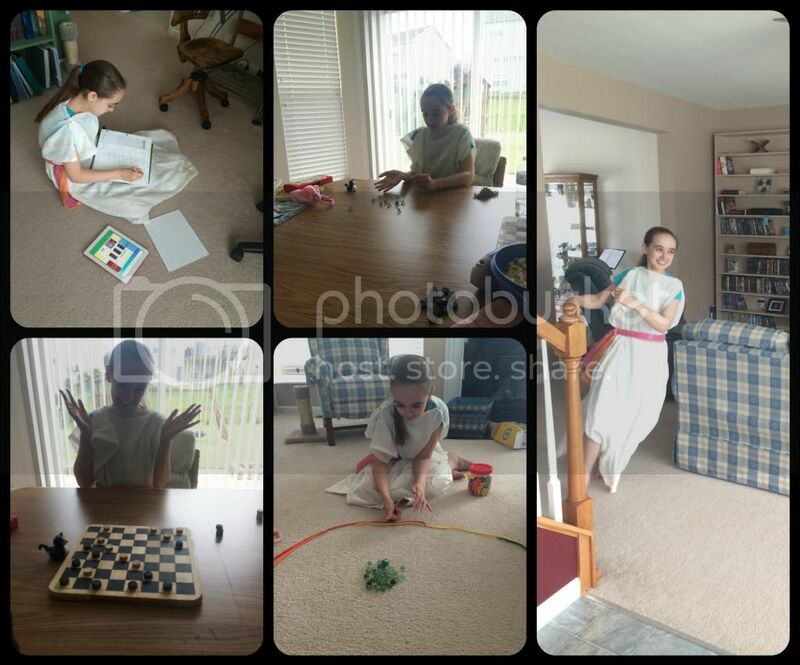 She was a little upset that she wouldn't be able to be in a group setting with her friends again until September, unless they all attend activities with the homeschool group over the summer. This week we both were feeling a little more burned out on school, but we haven't completed enough for us to just stop. We have the hours completed, but the topics would be unfinished making it rather awkward when we start the next level in these subjects next year. We did make a few adjustments that seem to have helped. Grammar completed all on its own, so while it is beneficial at this time of year, it wasn't something that we orchestrated as a help. We did decide to end spelling for the year. Amber was nearly done with the curriculum and we felt she was not going to get much more out of it this year, so it was time to stop. This means we are just completing writing, history, science and math each day. Hopefully, the limited subjects will help us make it the remaining few weeks. (TOP) Amber during the last day of homeschool group classes. (BOTTOM-LEFT) I did say she was temperamental about food. She's actually goofing off here though. Her manners are actually quite nice. (BOTTOM-RIGHT) Kitties waiting up for (sorta) Amber to come home from rehearsal. They missed her. I had a fabulously fun Roman day planned for later this month when school was nearly over, but decided to have a Roman half-day this week to interject a little more fun into our school when we desperately have needed it. We will still have the original Roman day in a couple of weeks, but now I need to come up with some additional activities to fill in a few that already were used. I did find a most useful book to help plan our Roman day: Spend the Day in Ancient Rome: Projects and Activities to Bring the Past to Life. It has plenty of great ideas and even takes you through a day in the life of Roman children. 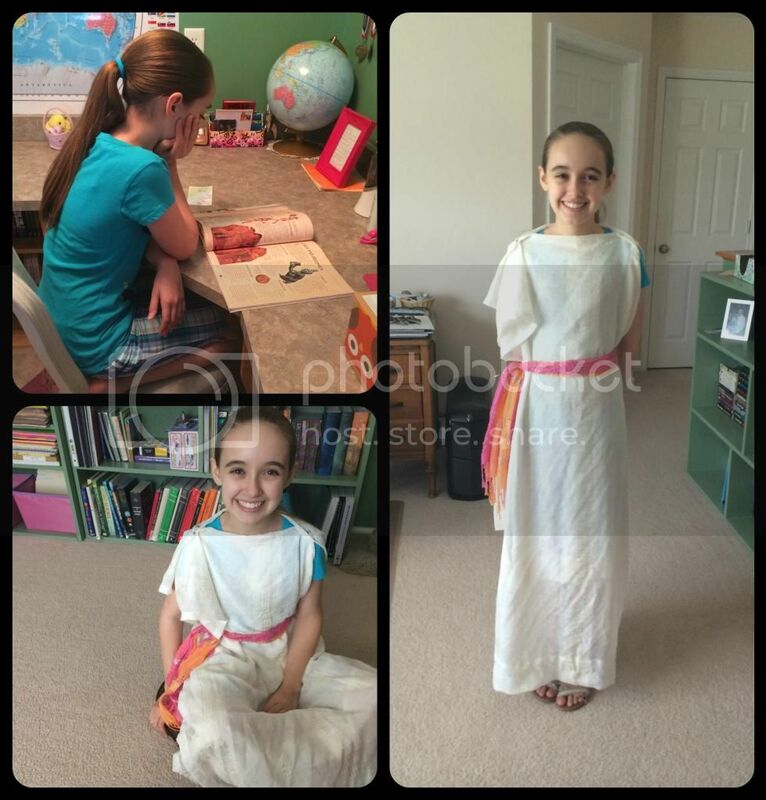 During our Roman half-day we started with Amber reading up on Roman family life, children, women, attire, and games. Then we made Amber a stolla from window sheers that I just replaced last month. They were the perfect size, weight and color. I couldn't have had better luck on that one. Amber learned more about Roman numerals than she already knew and did a whole math session on Roman numerals. She actually enjoyed it too. We then played several games that Roman children might have played, like knucklebones (jacks), tic tac toe, marbles, and checkers. All in all it made Amber very happy to have an activity and project based half-day and we both had fun together, even if I wasn't feeling all that great most of the day. Amber reading her history lesson for day, unaware of the projects planned. Amber sitting on a cushion, just like the Roman children did and all dressed up in her stolla. I'm already planning next year to have a lot more projects and less book work. This is too precious of a time with my daughter to spend it doing so much book work and she learns just as much from the projects with the reading assigned. I guess you learn a little each year and tweak your style a little too. Amber already says she can't wait to study the middle ages next year because, and I quote, "you are such a fun mommy that I know you will have great projects for me." There's nothing like your child's confidence in you to inspire great ideas. This summer, unfortunately, Amber will still be working on math which is no where near complete and also science. The science is a bit more fun than the biology we did last summer since it is Earth and Space science, which Amber loves and we get to use the telescope a lot more with the nicer weather. We do have a fun unit on the Philippines planned. We are going to learn all about their culture, some of their history, a lot of geography and even some of the Filipino language, Tagalog. I found the following resources that we are using starting in June: Filipino Celebrations, Filipino Friends, and Tagalog Flash Cards for Kids. So, why the unit on the Philippines? Well it is related to the mountains of paper work, the hours of phone calls, and zillions of emails I've dealt with in the past couple of months. Our family started the process a while ago, but this week we officially started the home study for an international adoption of an older girl (age 8 - 12 yrs) from the Philippines! We are wonderfully excited and also a little scared. Amber can't wait for us to bring home her new sister, whoever she will be. We are adopting, assuming our dossier is approved by the Philippine government, from the Special Home Finding list. This means the child will be a waiting child who needs a home and the time frame is basically as quickly as the paperwork can be done once we have selected a child that everyone, including the Philippine government, agrees is a good fit for our family. Amber doing Roman numeral math & playing various games. Also running crazy in the family room. Sometimes you just gotta be crazy in a stolla. This summer we will not only be studying the Philippines but completing our home study and dossier, converting Amber's playroom into a bedroom and our guest bedroom into the new playroom (sorry kitties.. you have to live like normal pets without your own room). It's going to be a very busy time for us, but we have the hope of a great reward at the end of the process. If you are so inclined, we would love prayers for this process to go smoothly and for us to know when we have found the right child. We have prayed a great deal over this decision and feel this is the path we should be taking. We feel there is a child out there waiting for us, we just need patience with the process. This weekend we are going to spend time with both of our mother's, who of course already know about the adoption and have been very positive. I also would like to just spend one quiet day with my family and not worry about school, adoption paperwork, cleaning, cooking, baking, or housework. That's my Mother's Day wish! I think I might just get it too. Christy!!!!! I read your post thinking of all the lovely things in it...The Hobbit, Co-op Game day, Roman day but then I came to the end and I am sitting here smiling so big for you all!!!!! I am so excited for you. Oh my gosh. What a Mother's Day gift. I can not wait to 'meet' the newest member of your family. I will start praying right now and continue. I am just giddy for you all!!!! Hug and love!!!!!! Thank you Karen! We are so excited but the process is long and sometimes painful in a mountains of paperwork kind of way. What exciting news!!! I am so happy for you. There are so many children waiting for a loving home. It will be such an exciting journey for you. Wonderful news! Praying with you as you bring home another daughter! Wow!!! Congratulations and we will praying that everything goes perfectly. I am so excited for you. I can't wait to 'meet' her either. I commented last night just before going to bed I was so excited about the news. Now I have to comment on the rest of the post. It looks like we will be doing math through the summer as well. We will be going until the end of June for school. I am legally required to do that. The funny bit is that our final portfolio is due on June 15th. We ended up doing fun things and running out the clock those last 2 weeks. I have started to think about next year as well. We are seriously considering using Writing with Skill next year. I saw it on the shelf at our local store and remembered that you use it. Getting my kids to use anything regulated is tough but they really needed it in writing. Thanks for the prayers. It seems like every other thought I have is about some paperwork that needs to be done. My remaining thoughts are about Amber's food. Lol. Writing With Skill is not an easy peasy curriculum, but it fits us well. We don't rush it and Amber has learned a fantastic amount from it. It also speaks to the child and encourages independence and responsibility. Don't get me wrong, there's a teacher's guide that I feel is necessary, but it is not a lecture style curriculum. It also isn't a "send your child off to write" curriculum. It is just the right balance for us. Amber makes such a cute little goblin and Roman girl! Adoption?! How exciting! I'll surely be praying about this! How in the world did you ever keep that a secret? You guys must be over the moon! Congratulations! I'm so very excited for you and your family! Congrats!!! I'm happy that Amber had such a wonderful time with the Hobbit and look at how cute she was dressed for her "day in Rome"!!! Thanks! Who knew old sheers with repaired cat tears could be so cute, right? I am so thrilled for your family. Cannot wait to meet the new addition!